^ a b c d e f g h i "164th Airlift Wing". Archived from the original on 28 January 2007. Retrieved 18 October 2015. ^ a b c d e "164th Airlift Wing". 164th Airlift Wing Public Affairs. Archived from the original on 4 March 2016. Retrieved 18 October 2015. ^ Sources differ as to whether eight or nine C-141s were the original complement of the group. ^ "Bob Wilson Inducted into Tennessee Aviation Hall of Fame". Memphis International Airport Notes. December 2006. Archived from the original on 2 February 2014. Retrieved 18 October 2015. ^ "Tennessee Air National Guard Dedicates New Facilities". Memphis International Airport Notes. November 2008. Archived from the original on 23 February 2012. Retrieved 18 October 2015. ^ Lollar, Michael (2 February 2013). 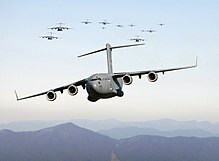 "First of military's latest cargo carriers join Air National Guard in Memphis". Memphis Commercial Appeal. Archived from the original on 1 February 2014. Retrieved 18 October 2015. "164th Airlift Wing". GlobalSecurity.org. Retrieved 17 October 2015. This page was last edited on 5 February 2019, at 09:57 (UTC).